We use it on our 3 compartment sink and is connected with DEMA chemical dispenser. It reads perfect amount of ppm and sanitizes all our dishes very well. I will be ordering more of these for sure! Works well for us in our coffee shop. a little goes a long way so it lasts much longer than you might think. just make sure to wear gloves because this stuff will eat up and dry out your skin! Very happy with this purchase, we use it in our sanitizing sink as well as our sanitizing bucket. I like the smell of it so much better than bleach! This is very potent but gets the job done with very little product. A little bit goes a long way so these 4 bottles will last you for months. I would recommend wearing gloves while using this product if you have sensitive skin. This sanitizer works great. It uses 1/4 cup per batch in our three bay sink so it lasts pretty long. I would recommend this product. I bought this 4 pack prior to having the plus shipping and the cost was pretty high to ship. We can't use bleach in our shop because of allergies to this is a good alternative. The product smells good. No strong fumes to deal with. We hooked this up to our dispensers and had perfectly mixed sanitizer for use on our sink. Do you need a chemical to kill all the diseases that have taken up residence on your dishware? This will do the job. It's blue, so you can tell you added it to the water. Just don't forget your test strips so you know you used enough! We use the sanitizer to make sure all of our dishes are safe surfaces for our patrons every day. With easy to use as directions, I can rest assured that everything we serve is 100% safe for consumption. Great product to sanitize your daily dishes. Great consistent product to know your customers are safe. Works great with portion pumps made for these gallon jugs. Sanitation is a must and we are very happy with this product and use it everyday in our triple compartment sink issue free. Highly recommended! This product is easy to use. It has little odor and is pleasant to work with. I use the for my third sink and espresso machine for deep cleans. This sanitizer is great! We use it for our three compartment sink and haven't had any issues with it. Webstaurant's price for this product is unbeatable! This is perfect for your three compartment sink and a little bit of the stuff goes a long way. I was really please with it! Works great, I use these bottles with a pump on top for nice easy dispensing. Standard quat ammonium so meets the health department requirements nicely and is not nearly as temperature dependant as other sanitizers either. This sanitizer is horrible. I normally don’t have any allergies, but anytime I’ve use this I’ve developed bad rashes on my hands especially where my ring is. Thank you for your feedback! We’re sorry you did not prefer this product. We recommend that you wear gloves when manually washing and sanitizing tableware and glassware. For recommendations, please contact our Customer Solutions team. It's hard to find sanitizer anywhere around me, so it's nice to know that webstaurant has it, and at a great price too! Works great. We're moving over to quats from using bleach, and while it's more expensive it goes a long way. Effective, health department approved. We both the pump mechanism to go with it to make measuring a breeze. This s a great alternative or generic type of quat. You use quat strips to test and it performs perfectly for your red buckets or machine. Noble is an excellent brand! We highly recommend this chemical Sanitizer for you kitchen! Great quality! And a must have for the “3rd” sink! 4 stars! Chemical shipped quick and seems to be a quality product at a competitive price. I plan on using it with a sink dispenser and it seems to be more concentrated than some other options. I try this one after reading the reviews, my current sanitizer is $20 more but 1,5 gallons less. I test it with my test strip, and it show exactly the same ppm like name brand results! This bacti-free comes in an excellent size to be able to make sure that you have all the sanitizing needs you could ask for. It's ideal! Great third sink sanitizer and happy that it's blue, makes it easier to tell quickly if someone has not added any even before using a test strip. This Noble 3rd sink sanitizer is Great. It works like it should and sanitizes well. We will be purchasing more of this in the near future. This sanitizer is an ideal way to be able to get your dishes sanitized according to the law, but also not blow your budget. It's an ideal size! 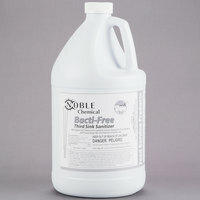 The 1 Gallon Noble Chemical Bacti-Free Third Sink Santizer is a great product. It santitizing well and it doesn't cause redness or allergic reactions to even people with the most sensitive skin. We love this sanitizer! There's not much else to say, other than this is the only sanitizer we will use. Great quality at a good price. A genuinely special product at a great price. It works really well for my staff and I. Love the quality and how effective it cleans. My small business uses a shared kitchen space, so I bought this to keep around just in case the kitchen dish machine runs out of sanitizer. It makes me good to know I'm compliant with health standards using this product. This cleaner works very well for my needs to keep my kitchen clean. Webstaurantstore has different cleaning solution options but I will continue to order this one. The 3rd sink sanitizer is a good product to have for hand washing dishes, it helps give your dishes the extra clean they need. You only use a small amount in the sink. I use this product to sanitize my Italian Ice scoops, pizza cutters, spatulas, and whatever items that come in contact with food in my concessions trailer. Excellent price. I buy some of my stuff from a food truck and the price from the food truck was unreal. The price from Webstaurant was half of the food truck price. This three unit sink sanitizer works well. We use it daily to wash all our large pots and pans and have never had an issue with it. Good Price for the product. These are expensive in general no matter where you shop for them. We actually ran out at one point and tried what the local food service store had which was a cheaper product but their product was not good. This is a much better product! Very good product, easy to handle and use for anyone, good instructions. Good for small restaurants or small kitchens. Great quality. Would like to see more options to sanitize water. This is an excellent way to keep your business up to code and your dishes clean. I've never had any negative comments from the health inspector about our sanitizer after switching to Noble brand, and it's much cheaper than competitors! We recently switched from the same sanitizer which was costing us almost double. I hope it works with our dispenser otherwise I'll install one myself and save over $1,000 a year. Also switched to Noble pot and pan soap with great results. We had been using a pour thru sanitizer dispenser that has worked well but is rather expensive. We are in the process of switching over to this one which is much cheaper! I just wish I could find a dispenser for this for perfect PPM everytime. This is very convenient to store and use. It is great for using with a three bin sink and with spray bottles. Works great and is a great price. This is a nice third sink sanitizer. The price is quite reasonable. It arrived very quickly. It can save us some money. I like this item. This product goes a long way for a little cost. This is a very good bleach replacement and is not as harsh on the hands. we will continue to use this. The other reviewers are right, it doesn't take much. I use 2 tablespoons in 1/3 sink of water. I'm not sure why other reviews said to use the chlorine test strips. I use the Quat strips and get a good reading. The chlorine strips did not register any concentration. It does tend to foam as I'm filling the sink, but this dissipates within a few minutes. No smell. No chemical feel on my hands. Why pay twice as much for sanitizer from your local linen company? You can buy Noble Chemical Sanitzer for half the price! Save on your bottom line and grab some today. This is a good product. We have tried other products in the past. This seem to fit our needs. i highly recommend this good product. We wanted an alternative to bleach for our sanitizing sink and found this. We love this! It doesn't stain or bleach your clothes, has a pleasant scent, and a little goes a long way. Even though the shipping is more than we like, we will keep buying this great product. Fantastic product. Being a restaurant with a three bay sink can be a challenge. But products like this make our job easy to maintain a clean safe environment for all of our kitchen items. Works wonderful - a few tips that I would have appreciated learning beforehand without needing to dig too deep - You will need chlorine test strips and also if you have a water/sanatizer ratio system you will need to adjust accordingly. Other than that this is a wonderful product, works just as well if not better than the 'name brand' that costs twice as much! Love this sanitizer it's easy to use and a little goes a long way. I'm glad I found this product and it's a great price. We've been using this sanitizer forover 9 months now and we're very happy with the results. a little goes a long way and glad that it's eco friendly. This is a really nice sanitizer and is super easy to use. I like that it is easily and readily available on here. No weird/nasty smells left over from use. Good product. This sanitizer really gets dishes looking good, clean and sanitized feeling. It also lasts a really long time and is priced reasonably. This cleaner is amazing! We sanitize our equipment each morning and it's as easy as running a sink full of water with a cap full of this stuff and let it do the rest! Cleans well and rinses off great. Great product for the price. Health inspection passed with flying colors. Instructions are easy to follow. Got rid of my service guy who supplied me on a monthly basis... Saved tons of money. with any restaurant using a sanitizer is very important. this one gallon jug product can be used any way you need it to. triple sink, spray bottle, and even cloth great product. You cannot beat these for a better price anywhere. I definitely would buy these again and again and would highly recommend them to anybody because I have shopped around for price comparisons. By far the biggest bang for your buck and they last a long time in bulk! We previously used a "name brand" sanitizer which cost about 3 times as much as this product. They are very similar in how they perform. This sanitizer is highly recommended! A great Sanitizer...reasonable price for the quality you will receive. I would recommend this product to all that wash glass wear and depend on a clean product in the end. This gallon of sanitizer will last my business a long time, as it is so concentrated. A very good value, with clear directions on the bottle. This is a very effective sanitizer! The PPM always stays constant and it is very reliable! Considering its promise, I must say that I am very satisfied with this product. 100 percent satisfying results with this sanitizer product! Works just like more expensive brands yet much more affordable! Easy to use with other cleaning products! If you are serious about safety this is definitely the way to go. A sure cleanse with this sanitizer! Great discount case prices! Great Deal!! Were very pleased to find this as a drop in solution with the same dilution rates. More product, less money! We are always looking for a way to save a little money and bacti-free is a great and just as effective solution for our sanitation needs. I just wish that it had a dye in it because it is clear.